Tazza Kitchen Bets Big in Scott’s Addition | Food and Drink | Style Weekly - Richmond, VA local news, arts, and events. 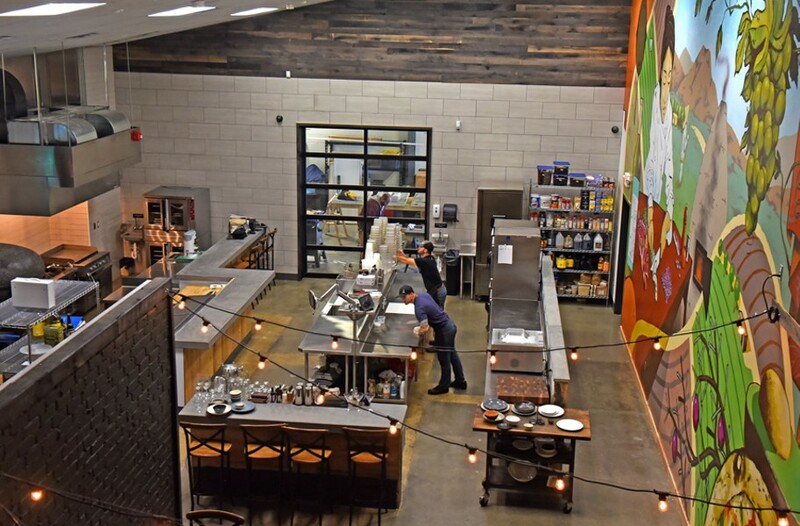 Scott Elmquist Tazza Kitchen takes its food to the next level with a spacious new research and development space and prep kitchen for all of its restaurants. UPDATE: The newest Tazza Kitchen will open for dinner today, 12-5-17, at 4:30 p.m. in Scott's Addition. "In the coming weeks," the restaurant's representative Susan Davenport says, "we will expand to offer lunch (Tuesay-Saturday), Sunday brunch, and happy hour (Monday-Friday). 11-14-2017: It's a big smoker. Made from an old, 1,000-gallon underground propane tank, when you climb the steps and open one of the large doors, you'll see six beef briskets slowly cooking away. The next door reveals another six and several racks of ribs. You'll see something similar if you take a look behind the other two doors. And at Tazza Kitchen's new office and central kitchen in Scott's Addition, that monster isn't the only smoker parked by the side of the building. There's another smaller one — smaller being a relative term — that is hauled to events when it's not in use. Previously, both smokers lived outside of Tazza's Alverser Plaza location. Smoked meat might be a siren call to some of us, but the restaurant's neighbors — doctors' and dentists' offices — weren't always thrilled by the scent. "We kind of wore out our welcome there," says co-owner John Haggai, who handles construction — and the bar program — for the company. "I was tasked by Jeff to quickly [find a new space]." Jeff is Jeff Grant, also a Tazza co-owner and the man in charge of everything you eat at the restaurants — he's the one smoking briskets for upwards of 17 hours. "We're just total geeks about wood-fired cooking," he says. The reaction from Tazza's new Scott's Addition neighbors? "All we've gotten is, 'Dude, it smells so good. Can I eat a taco?'" Grant says. Right now, the newest Tazza location is under construction across the street from the Handcraft Building. A few blocks away, in a deceptively low-profile, cinder-block building that used to house a diesel repair shop, the new research and development and commissary space soars behind the offices in front. There's a wood-burning oven in the back, lots of long shiny stainless steel counters, a fully stocked bar station and a table where the team is experimenting with place settings for the new restaurant. The plan is to do the majority of prep work in what Tazza is calling the big kitchen. Grant says, "It's going to make the operations of all the restaurants improve, and not only that, it'll give us an incredible degree of quality control." It also makes event preparation much easier. Previously, the team worked out of Tazza's original spot in Short Pump — and controlled panic might be one way to describe the process. Now surrounded by plenty of space and equipment, the relief is palpable when you talk to Grant. With his hands in the pockets of his coat, the bearded chef shows off the new kitchen with something akin to awe. Tazza has grown rapidly since it began in 2013. The Scott's Addition restaurant will be its sixth. The third owner, John Davenport, originally came on first as an advisor, then an investor and now, after falling in love with the industry, manages Tazza's administration and finances. "Someone in the restaurant business asked me if I though Scott's Addition was way over," he says. "I said, 'No, it's probably in its third inning.'" First came the breweries, and although restaurants dot the boundaries of the neighborhood, Scott's Addition is poised, according to Davenport, to become the city's next restaurant hot spot. "These buildings are open boxes for people to come in and redevelop," he says. The latest Tazza will start stoking the grill and firing up the oven in December. When you walk in, you'll immediately be confronted by the enormous kitchen surrounded by bright blue bricks. It dominates the room, and that's intentional. Haggai says the place is designed to bring diners fully into the sensory experience of the wood, the fire, the smoke and the sound of the crackling food cooking over open flames. "The only thing separating us from the customers is a banquette," he says. "So, you're part of the party if you're in here."